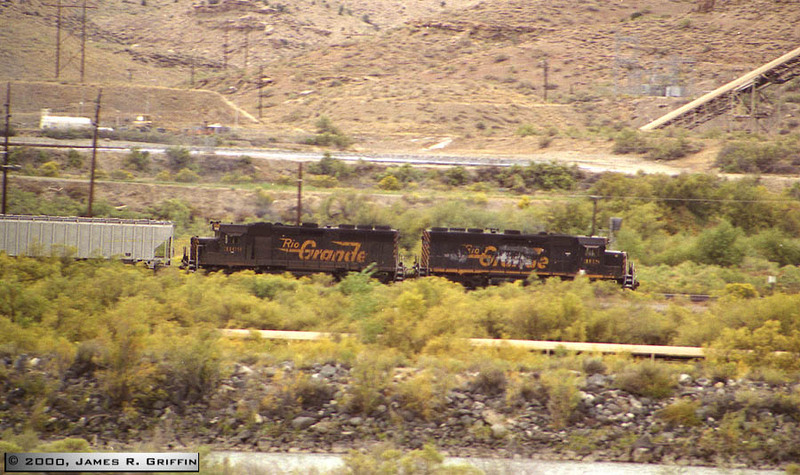 Rio Grande was a long-time buyer of 4-axle diesels. 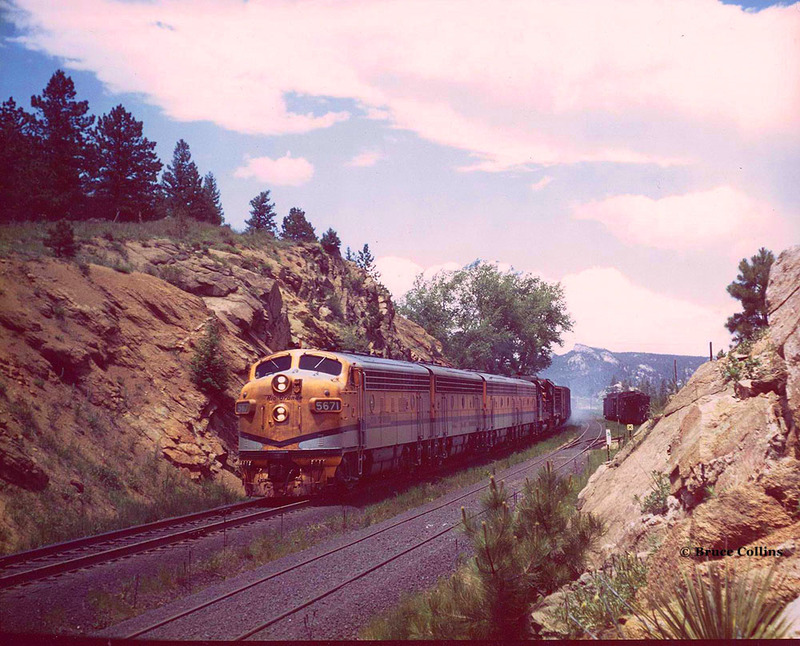 True, nothing else was available in 1941, but going against conventional wisdom the railroad found a way to make B-B traction effective on its steep mountain grades. The D&RGW also used a variety of switcher locomotives from all the manufacturers of the day. This page has tabular data interspersed with a selection of photographs of the various types. F7 No. 5671 and three B units are rolling eastbound at Crescent. Photo courtesy of Bruce Collins. Bruce took this photo sometime in the late 1960s at the cut at the east end of Crescent siding. The four F’s are leading a GP30 and another geep. Top: switching North Yard in Denver on 11/19/1990. 3001 – 3013 Apr-May 1962 Nos. 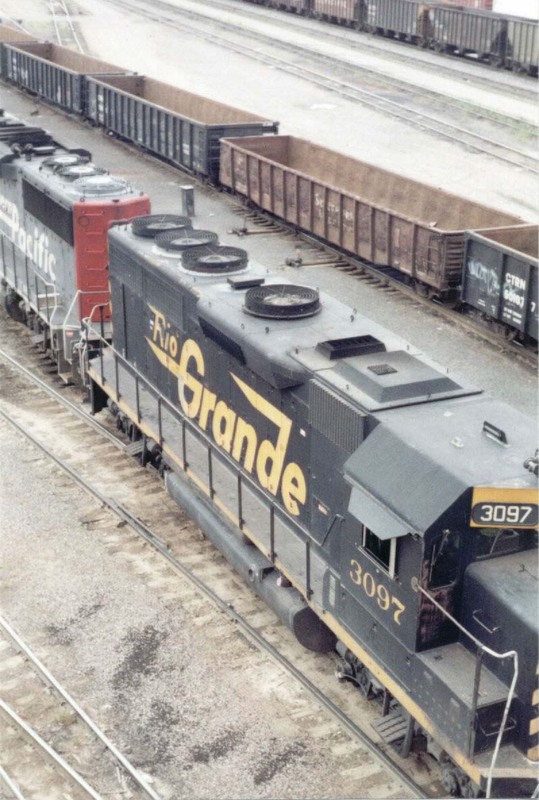 3001, 3002 later received large Rio Grande herald. 3014 – 3028 Jan-Feb 1963 Nos. 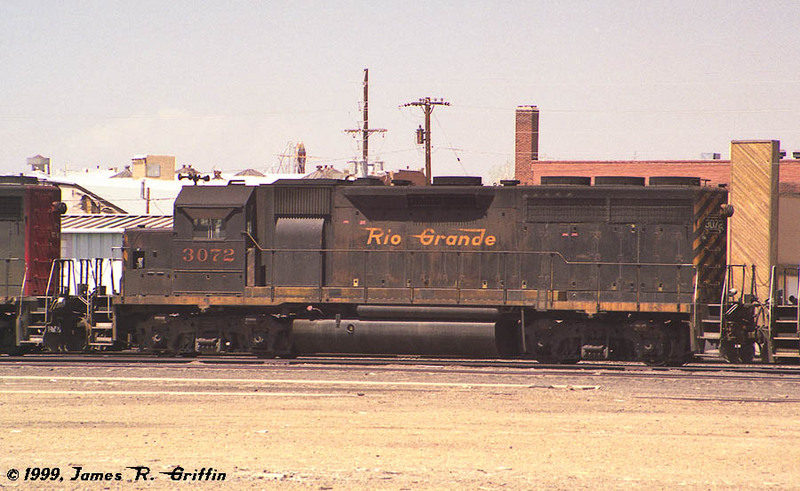 3014, 3027 later received large Rio Grande herald.Nos. 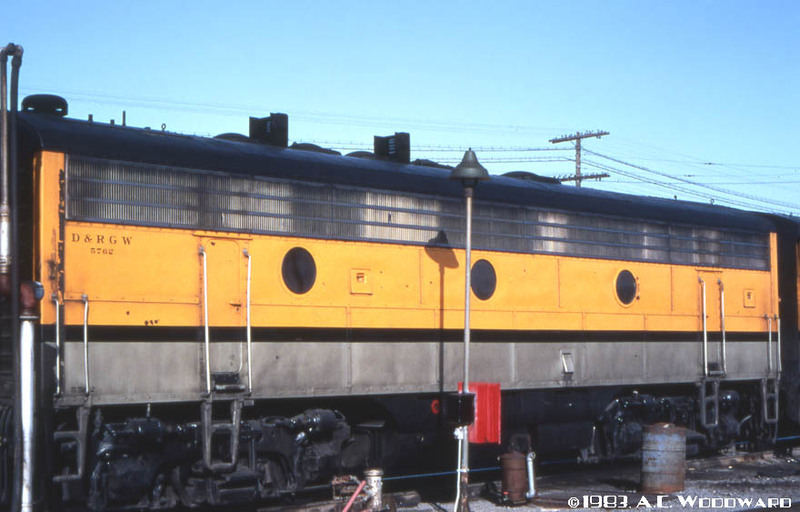 3021-3028 downgraded to B-unit status in 1972. GP30 No. 3002 — May 14, 1999, at Alamosa. 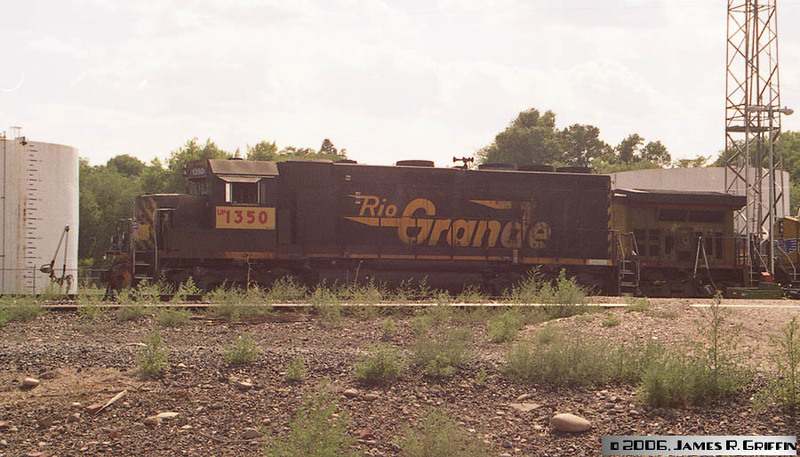 By the time this was taken, it was one of only 3 Rio Grande GP30’s still running. The other two (3003, 3015) were retired by the end of the month.The 3002 was retired at Little Rock on August 3rd, 1999, and subsequently scrapped. GP30 No. 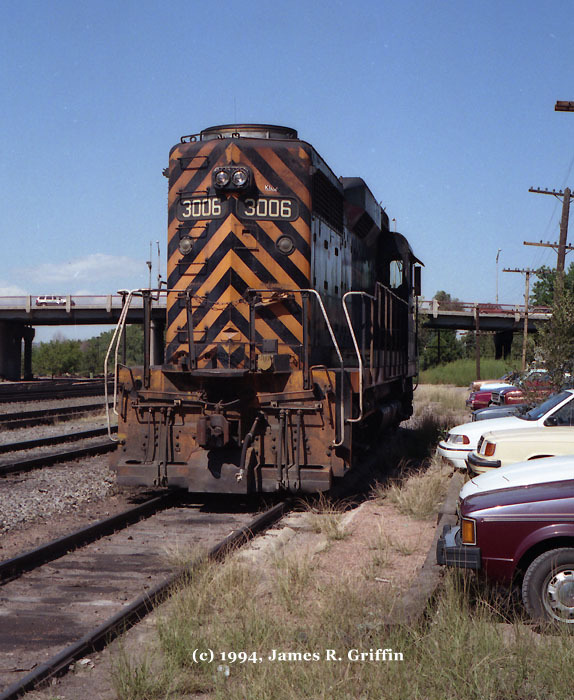 3006, two views, at Colorado Springs in September 1994. 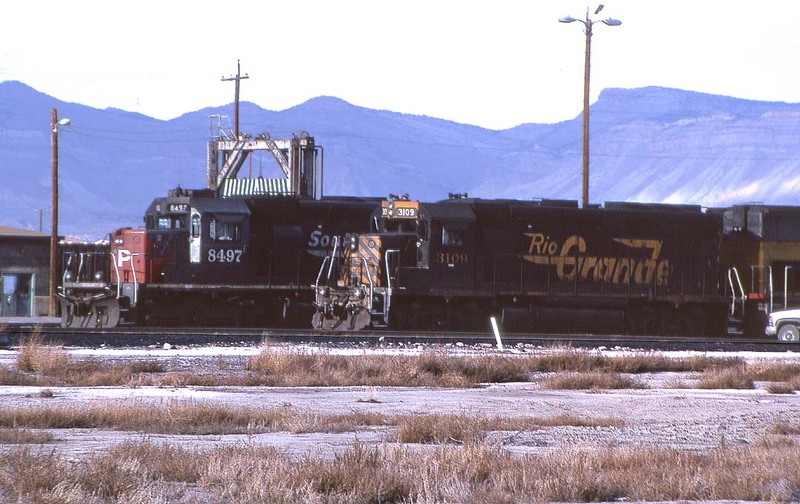 The Rio Grande and its two successor roads typically kept a four-axle unit in the Springs to handle the switching chores. There are a number of industries around the city that are served by the railroad. 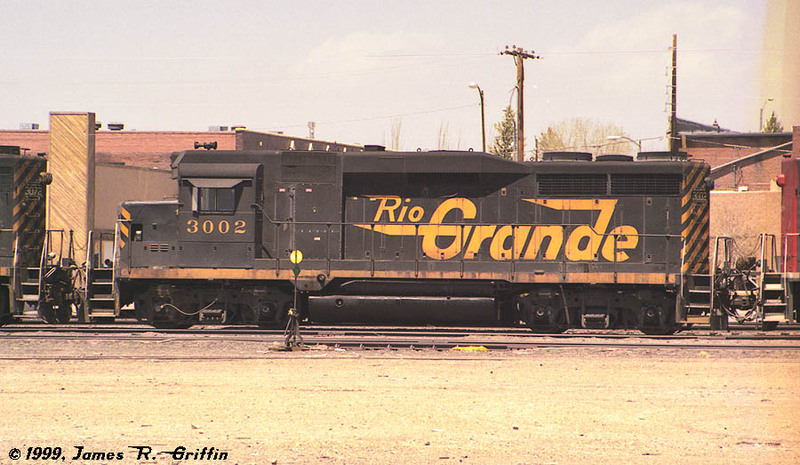 As of this writing there is still a Rio Grande caboose that is used for the local jobs.The 3006 was retired at Denver on December 23rd, 1998, and sold in September 2000. At last word it was stored at the Forney Museum in Denver. Two GP30’s, Nos. 3008 and 3020, seen on a work train near Mill Fork, UT on 8/28/1992.These units represent both orders of Rio Grande’s GP30’s. Note the difference in cab length. The 3008’s cab is shorter, so there is an extra handrail stanchion just behind the cab. Photo courtesy of David Verdi. The 3008 was retired on April 28th, 1997, and sold to NREX.The 3020 was retired in 1995 before the UP merger, eventually ending up on the Cimmaron Valley RR where it was wrecked in 2003. 3051 – 3063 Jan 1966 Demoted to B-unit status, 1972. Surviving units promoted back after SPL merger. 3064 – 3068 Sept 1966 Demoted to B-unit status, 1972. Surviving units promoted back after SPL merger. 3069 – 3080 Feb 1967 3069-3075 demoted to B-unit status, 1972. Surviving units promoted back after SPL merger. 3081 – 3085 Oct 1969 Delivered in Billboard “Rio Grande” herald. 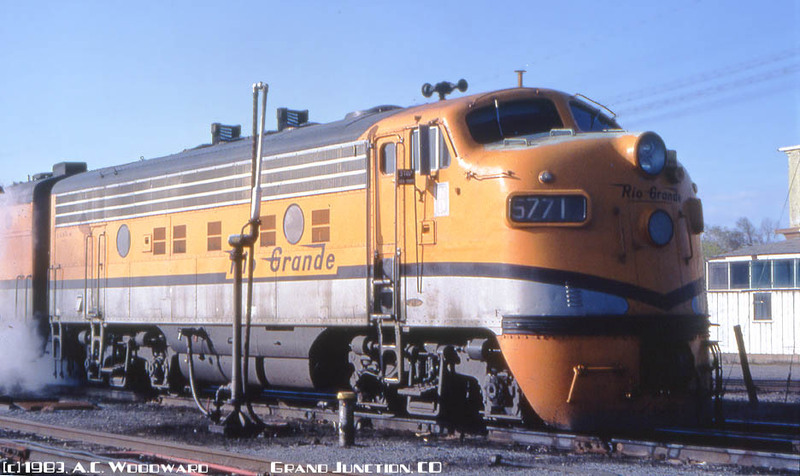 3086 – 3093 Nov 1971 Delivered in Billboard “Rio Grande” herald. Extended-range dynamic brakes on these units. 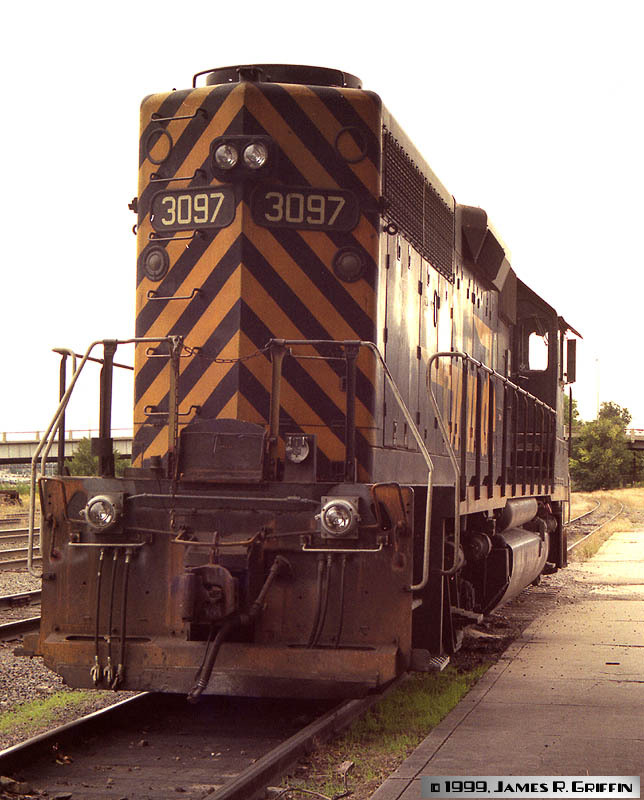 3131 – 3153 1983 Purchased second-hand from Conrail. 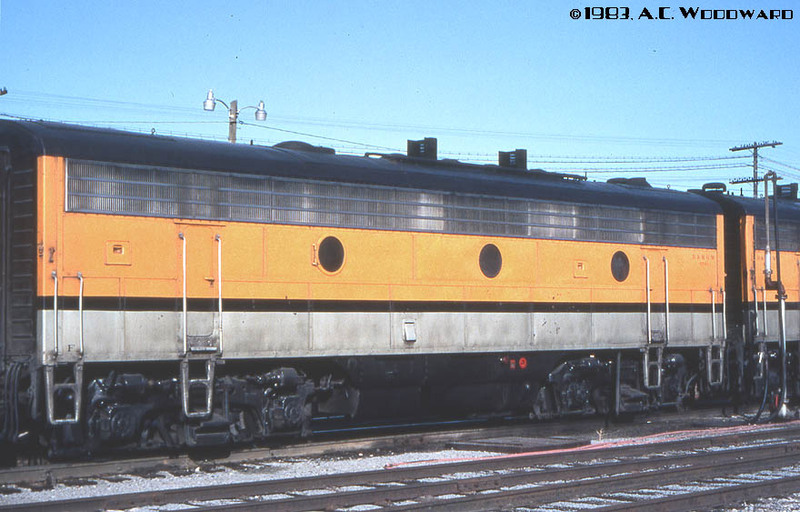 Had temporary unit numbers until repainted in 1984-1985, in a darker orange color than rest of fleet. No low-nose headlights on these units. GP40B No. 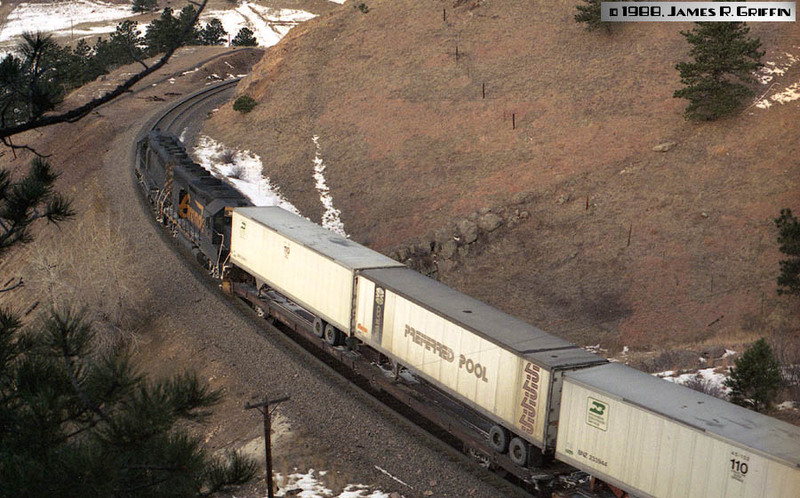 3051 — Dec. 24, 1988, on a westbound manifest at Tunnel 1 above Denver (shortly after the SP merger). 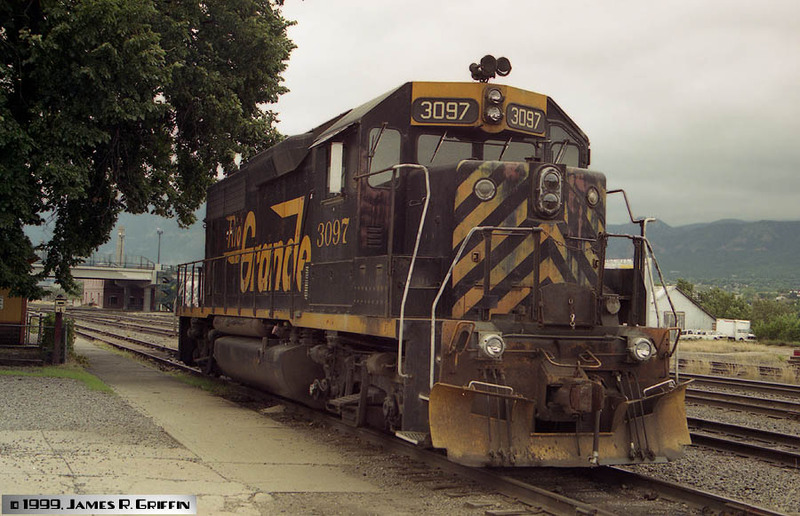 This unit is featured in my Detailed Photos section.The 3051 was retired in 1996, prior to the UP merger. GP40B No. 3057 — January 1982. 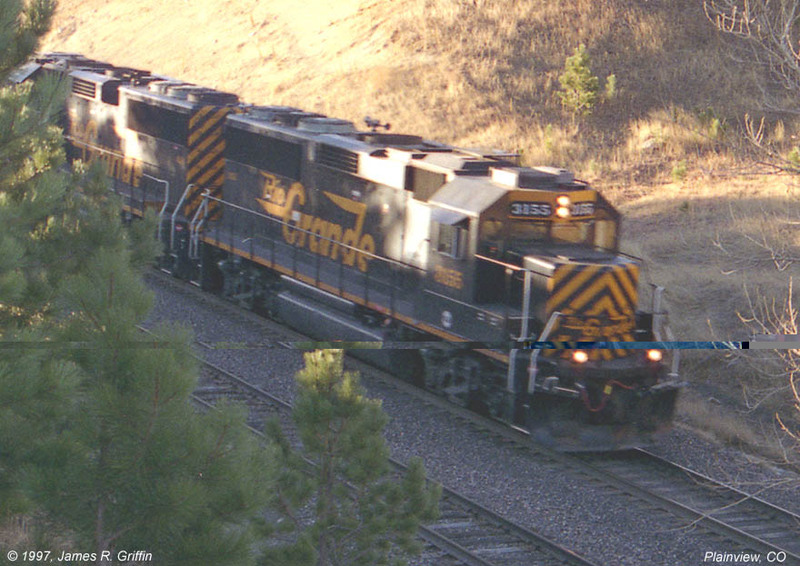 It’s the trailing unit on a westbound manifest at Blue Mountain crossing (Coal Creek Canyon). 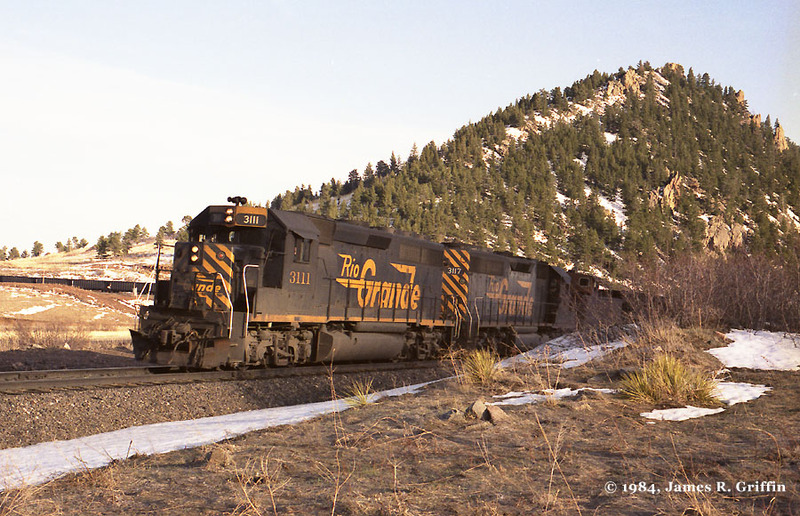 Dan Adams photo.The 3057 was sold to Omnitrax (Loveland, CO) in February 1995. GP40 No. 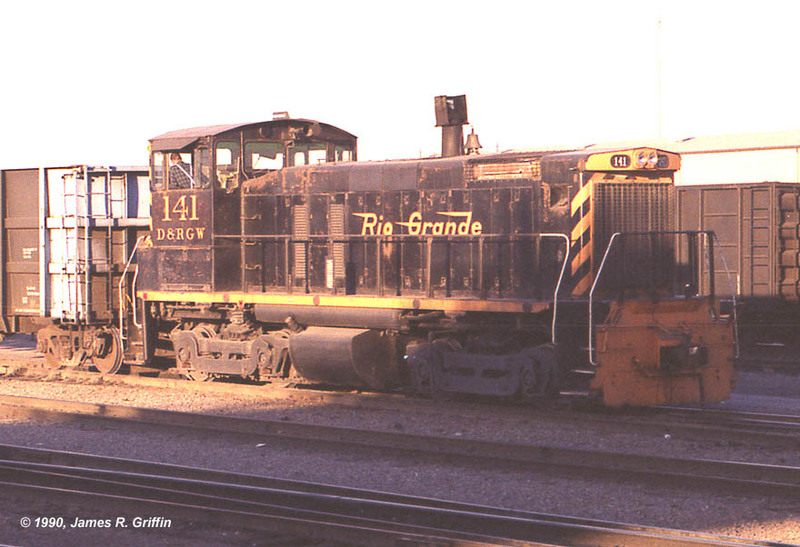 3065 — This unit was sold to Helm Leasing, and was sent to the new San Luis & Rio Grande Railroad in Alamosa. Here it is seen back on home rails but in different colors, on June 30, 2003. GP40 No. 3072 — At Alamosa, May 14, 1999. It was in the MPUAA road power consist, waiting for the locals to finish their chores.The 3072 was retired on May 15th, 2000. GP40 No. 3077 — Dec. 24, 1988, with the eastbound RailBlazer piggyback train emerging from tunnel one. That’s GP40-2 No. 3116 on the drawbar.The 3077 was retired in 1996, prior to the UP merger, and is now Helm Leasing (HATX) No. 806, working on the Vermont Rail System. Unit now classified as a GP40-3. Sometimes you just have to take what you can get… Here is GP40 No. 3080, buried deep in the readyline area at Grand Junction (8/03/1998). It’s mostly original, minus the low-nose lights. 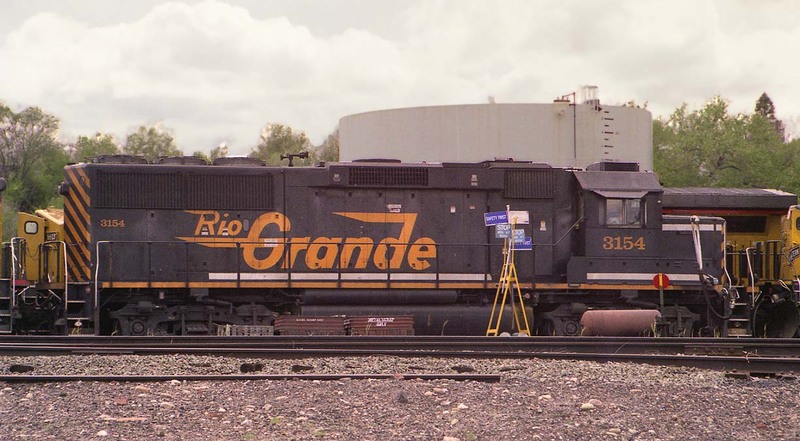 This is the highest numbered unit to receive the small “flying” Rio Grande herald.The 3080 was retired 6/20/2001, and sold 12-10-2001 to the W&LE. GP40 No. 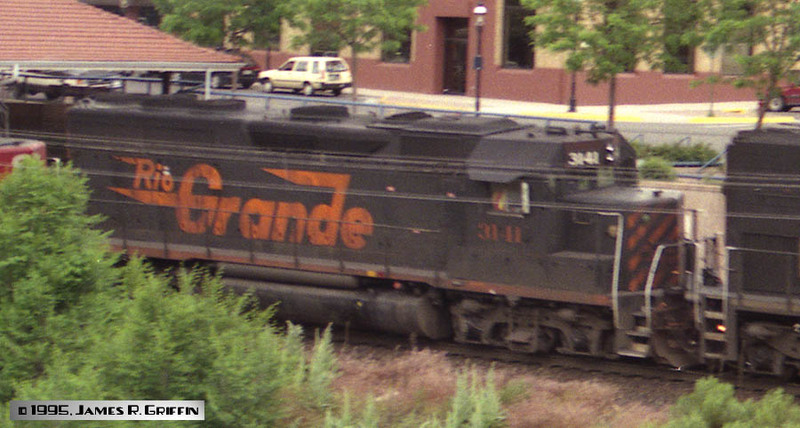 3131– This unit was at Alamosa yard on 8/02/97. This is a new scan, directly from the negative. Unfortunately, there’s only so much you can do with a backlit subject… However I have re-tuned the image again and it’s slightly improved.The 3131 was retired on 5/25/2001, and sold to the Wheeling and Lake Erie (W&LE) on 12/10/2001. GP40 No. 3141 — One of the Conrail geeps, passing the Glenwood Springs depot on 6/29/95. The 3141 was retired in August 2001 and scrapped in December of that year. GP40 No. 3149 — Another one of the Conrail geeps. Brad Hoeme photo.The 3149 was assigned UP 735 but never renumbered, and was retired in May 2000. 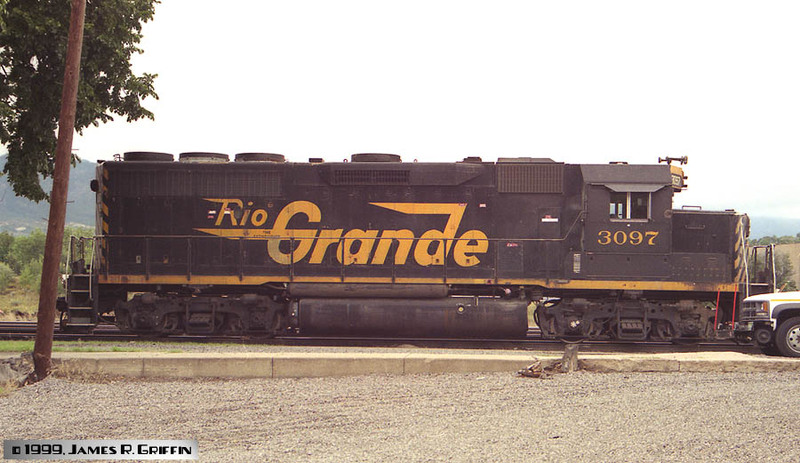 3094 – 3105 Apr 1972 All GP40-2s delivered in the billboard “Rio Grande” scheme. 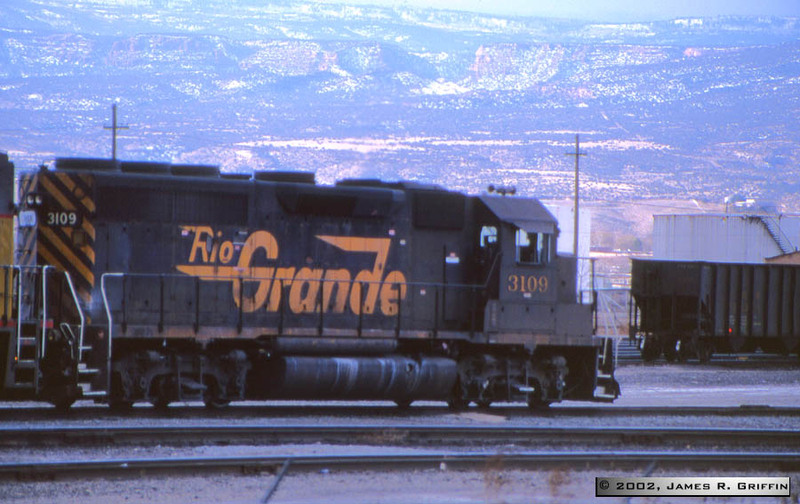 3106 – 3115 Dec 1972 All GP40-2s delivered in the billboard “Rio Grande” scheme. 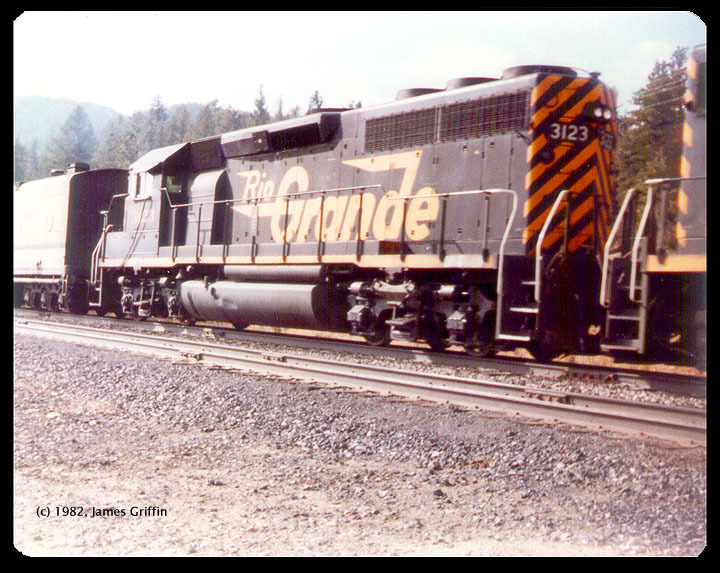 3116 – 3127 Sept 1974 All GP40-2s delivered in the billboard “Rio Grande” scheme. 3128 Nov 1974 Replaced wrecked GP40 No. 3063. 3129 – 3130 1983 Also wreck replacements. Have many updated features similar to EMD’s GP50 model. Three views of GP40-2 No. 3097, as it was serving as the Colorado Springs switcher, Sept. 19, 1999. The paint was starting to fade a bit by this time. Notice the lack of a nose herald on this unit. 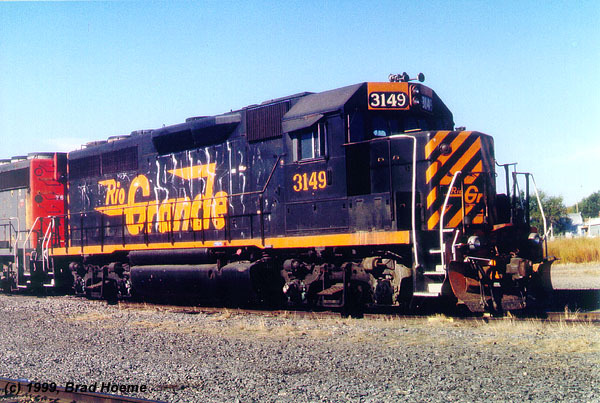 In earlier days it did indeed have the “Rio Grande” lettering on the nose, but lost it in the early 1980s for some reason.This unit was renumbered to UP 1352 in July 2005. Four top views of GP40-2 No. 3097. These were sent to me by Dave Crinklaw back in December 2000, and somehow I never dealt with them. After 16 years I rediscovered them in my inbox, so here they are! 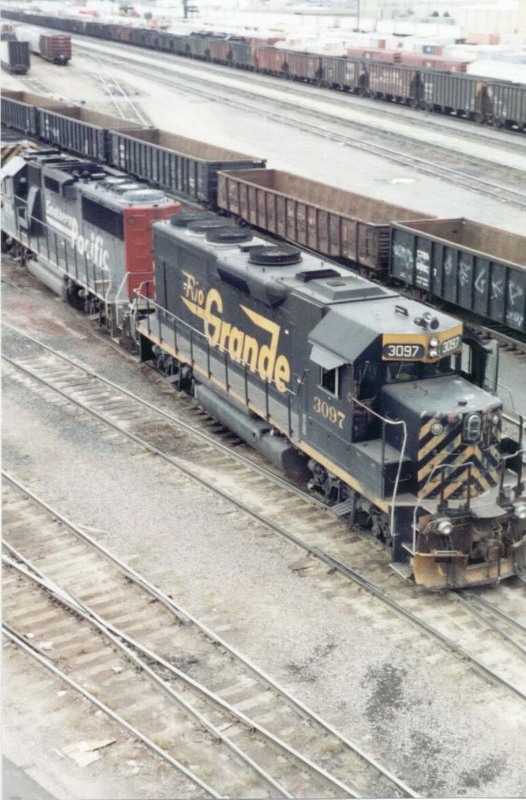 All I know about them is that: (1) they were taken in North Yard off the 48th street viaduct, and (2) they were taken sometime prior to December 5, 2000.These are nice sharp images and provide good looks at the top details of this early-version GP40-2. Too bad we can’t make out the numbers of the other two locomotives in the shots. No. 3100 worked around Denver and the front range for many years after the UP merger, but I never managed to get a decent photograph of it before getting patched. 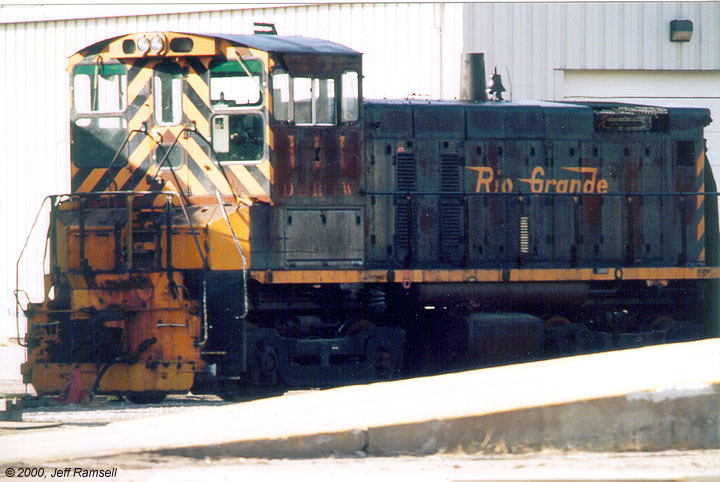 It was the last D&RGW GP40-series unit to be renumbered from its original number, on 1/31/2006. Here it is at Pueblo, on 6/30/2006, patched as UP No. 1350. This locomotive later received a full repaint. Here is a contemporary photo, in Grand Junction (April 2014). 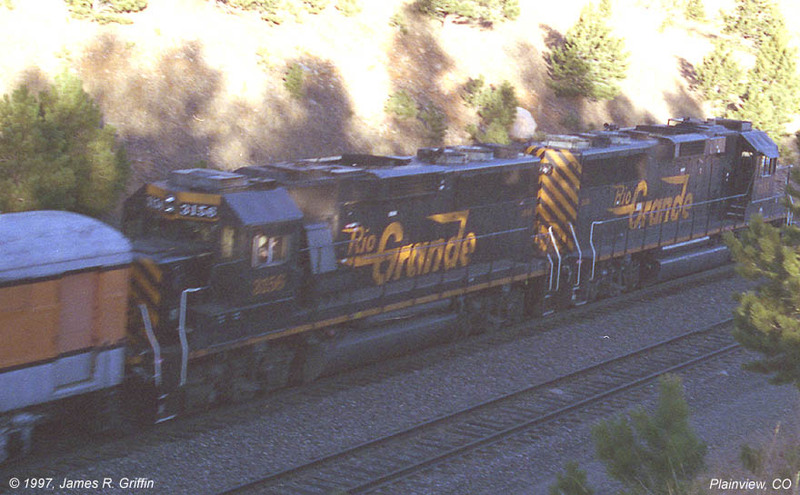 GP40-2 3103 and two mates are seen with a westbound fast freight at Glenwood Springs on Nov. 8, 1981. This was before the pedestrian bridge was built, and I was standing on a very narrow sidewalk with my back to traffic while I took this photo. See a simultaneous photo from ground level here.This unit was renumbered to UP 1356 in January 2005. Top: No. 3109 in the Grand Junction yard on 3/07/2002. Photos from the following day appear on my Locals page and in the Detail Photos section.Middle: Same date, from the opposite side. Also nice to see the two Espee tunnel motors present (even if one was now wearing Armour Yellow…)Bottom: GP40-2 Nos. 3118 and 3109 on the “Minturn Local”, hustling east past Cameo with a string of covered hoppers late on October 10, 2000. 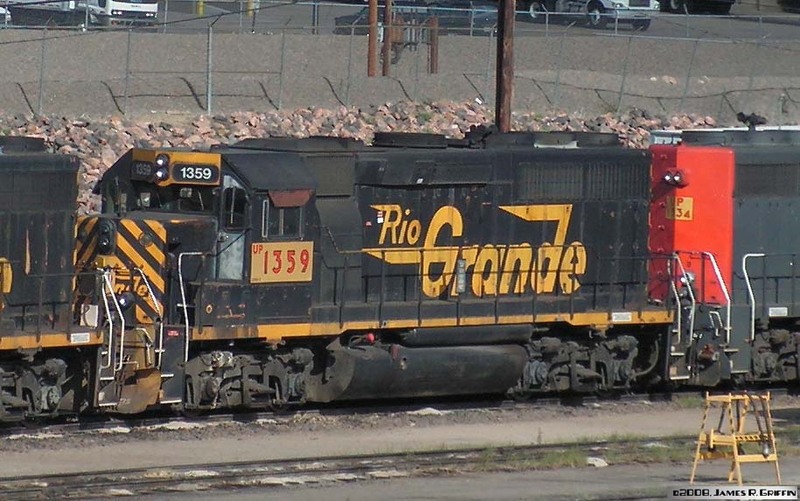 It was a rare and pleasant thing to see a train under all-Rio Grande power by this date. The 3118 had been rather heavily tagged sometime earlier (note the graffiti). No. 3109 was a complete repaint to UP 1364 in August 2005. Nos. 3111 and 3117: the West Helper on a CSDPU train. 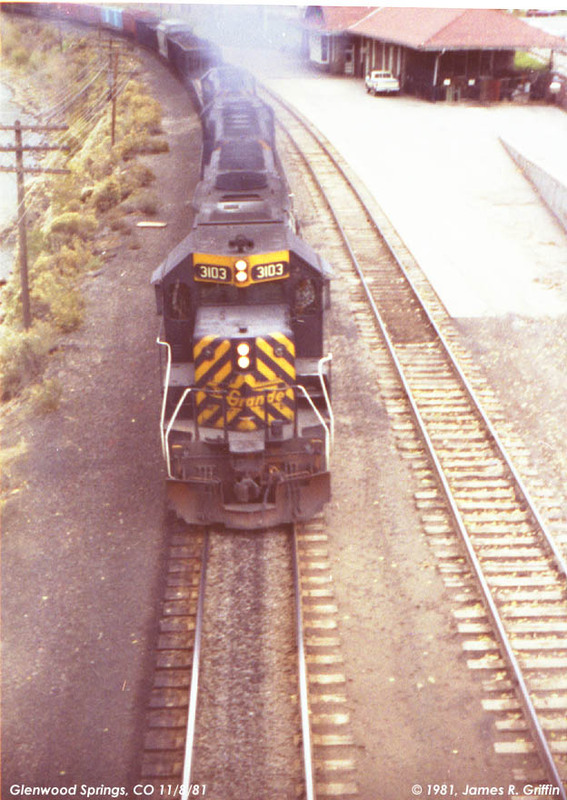 The two GP40-2s apply dynamic braking on the rear of the train as it crosses Coal Creek canyon in April 1984. The West Helper (set) would often ride a heavy eastbound train down the mountain for braking, then return light or with another train to Tabernash. Note the red class light on 3111. No. 3111 was renumbered to UP 1363 in August 2005, and No. 3117 became UP 1368 October of that same year. Top photo: No. 3118 sits on the readyline with the rest of the power for the Alamosa local, in the yard at Pueblo (9/19/1999). It’s been modified with a beacon (courtesy of the SPL era), the horns have been moved to the long hood (judging by the color, they’re a UP modification), and ditch lights have been added. But, the low nose lights are still there. The opposite side of the unit has been heavily vandalized by taggers. No. 3118 also receives a detailed study in the Detailed Photos section.Middle photo: The 3118 was patched to UP 1359 on 9/15/2005. 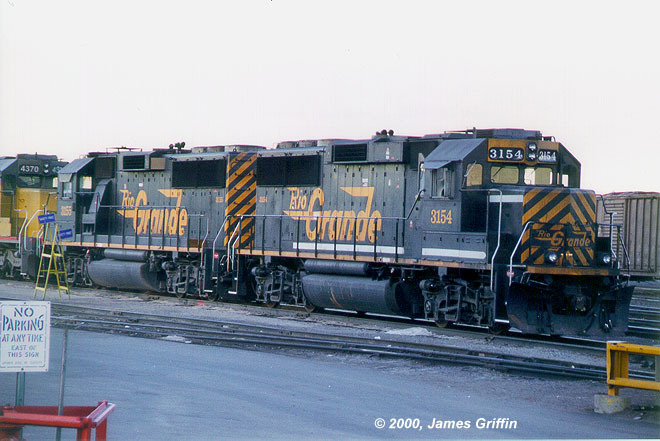 Here it is in Grand Junction on July 1st, 2006.Bottom Photo: The now- UP 1359 is parked at North Yard on 9/01/2008, coupled with DRGW alumnus UP 1348 (ex-DRGW 3126) and UP 1534, ex- SP 7299. Note 1359 still has the complete light package in place, though no word on whether they all work. No. 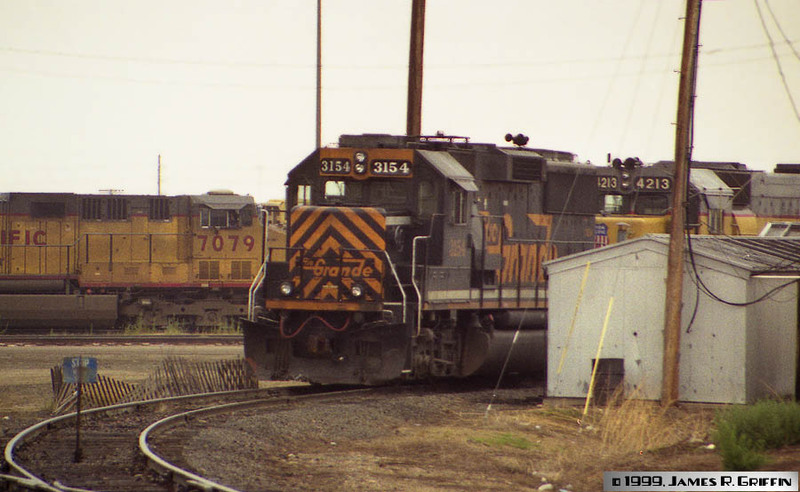 3121, two views from March 7, 2003.Top: Left flank view as the 3121 leads a train from Antonito northbound through La Jara, CO.Bottom: Photo from earlier that same day in Alamosa. Note the interesting writing on the plate covering the opening where the Pyle lights were removed. 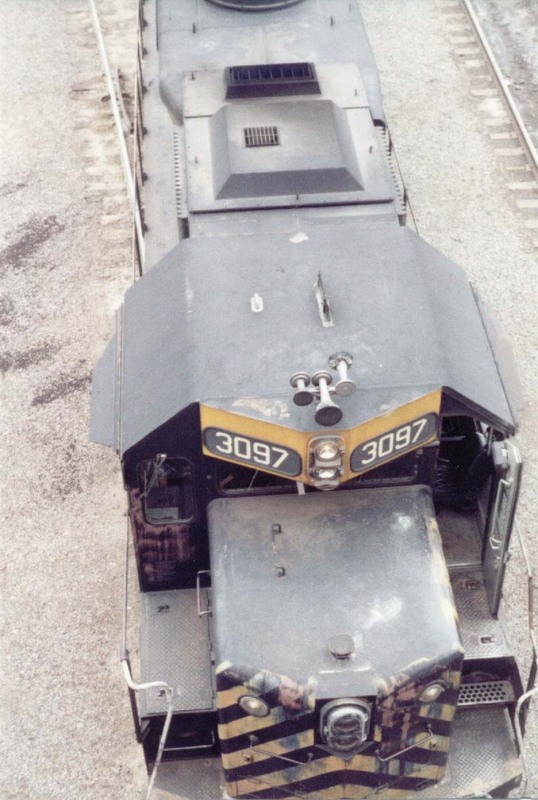 In these photos you can see the modifications to the locomotive done during the SPL era, including: addition of tall ditch lights, relocation of horn, change of number board style. The signal lights were removed after the UP merger. No. 3123 — On the Ski Train in January 1982 at Crescent, CO. Notice the dent in the fuel tank.The 3123 was renumbered (patched) as UP 1346 on Aug 10th, 2001. Top Photo: No. 3126 at Grand Junction on 8/03/98. Notice an unusual feature: ditch lights on the rear as well as the front. These are installed on locomotives that are used predominately in local service, where running long-hood-forward frequently can be expected. Their location above the deckline indicates an SP-era modification.Bottom Photo: The 3126 was renumbered (patched) as UP 1348 on April 27th, 2005. Here she is seen parked next to the North Yard tower on 9/01/2008. All lights are still in place, and she looks pretty good for a 34-year-old lady. No. 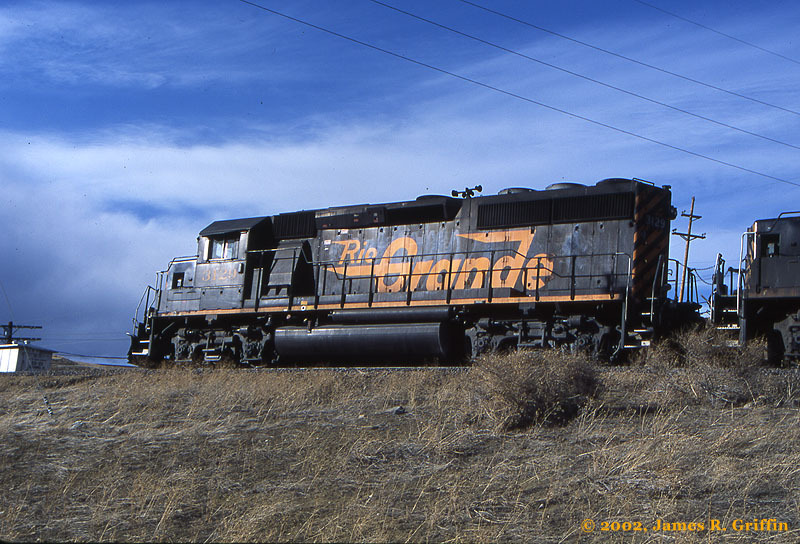 3128 — The highest-numbered “standard” GP40-2, still at work in Alamosa on March 7, 2003. It also receives a detailed study in the Detailed Photos section.The 3128 was renumbered to UP 1349 in May 2005. GP40-2 No. 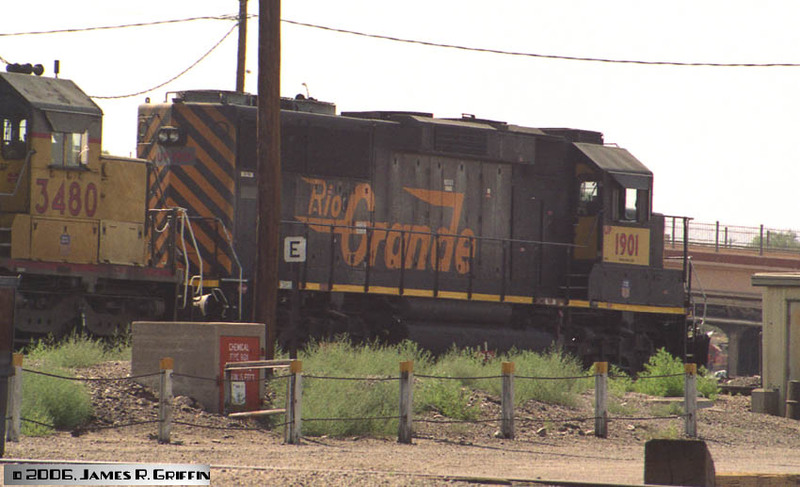 3129 — One of the last two GP40-2’s delivered to the Rio Grande, here it is working the West Local (Rocky) on 3/26/2002. This unit is featured on the Detail Photos page.The 3129 was renumbered to UP 1445 in November 2005. GP40-2 No. 3130 — The other of the last two GP40-2’s delivered, here it leads a westbound manifest on 12/24/1988. It’s exiting tunnel 1; you can barely make out the nose of #3131 in the tunnel. The shot of #3051 above is of the sametrain. 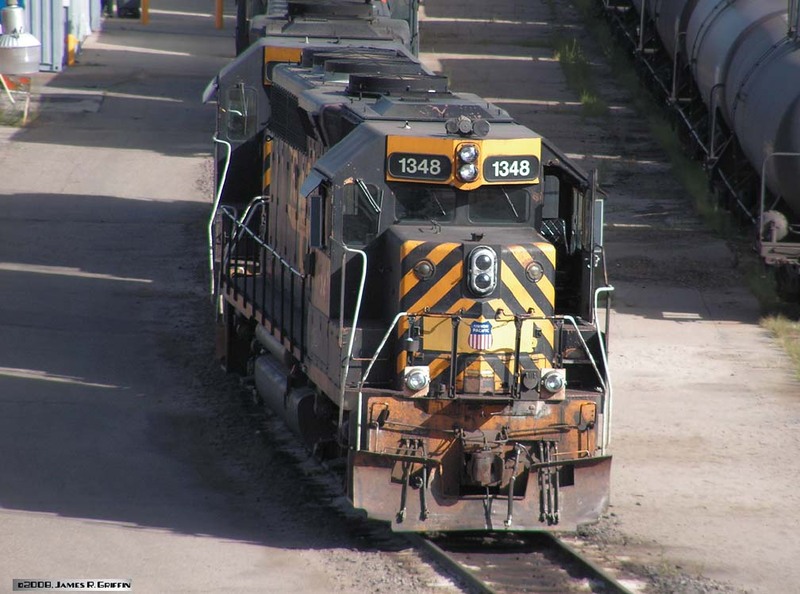 This unit is featured in my Detailed Photos section.The 3130 was renumbered to UP 1446 in March 2003. 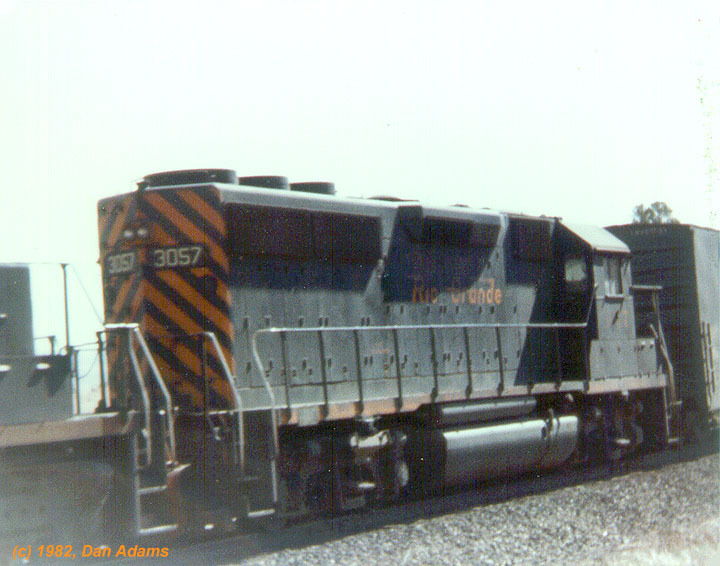 3154 – 3156 May 1990 Built to Cotton Belt specs. 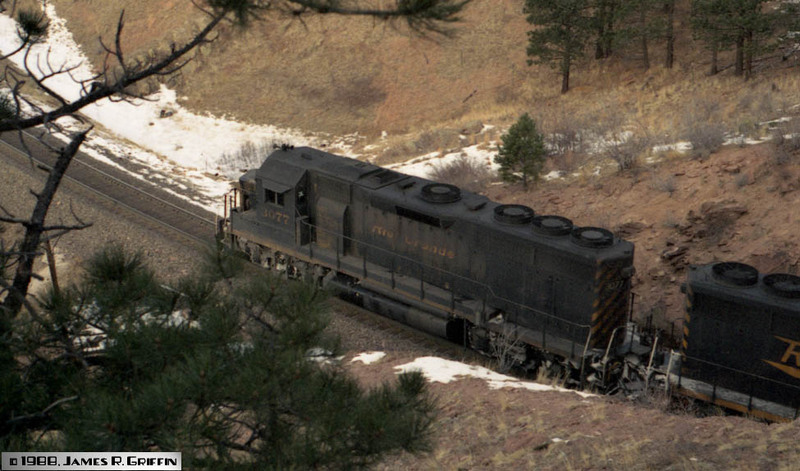 Built to replace three units (D&RGW 3108, 5402, and 5408) wrecked on Tennessee Pass in February 1989. Top: No. 3154 sits on the Pueblo ready line, May 16, 1999. The white reflective stripes, applied only to this unit, are clearly visible. Rumored that the El Paso shops did this. What were they thinking?Center: Another look at No. 3154, in Denver on a misty Sunday morn– Sept. 19, 1999. She’s on the leg of the wye on the west side of North Yard.Bottom: No. 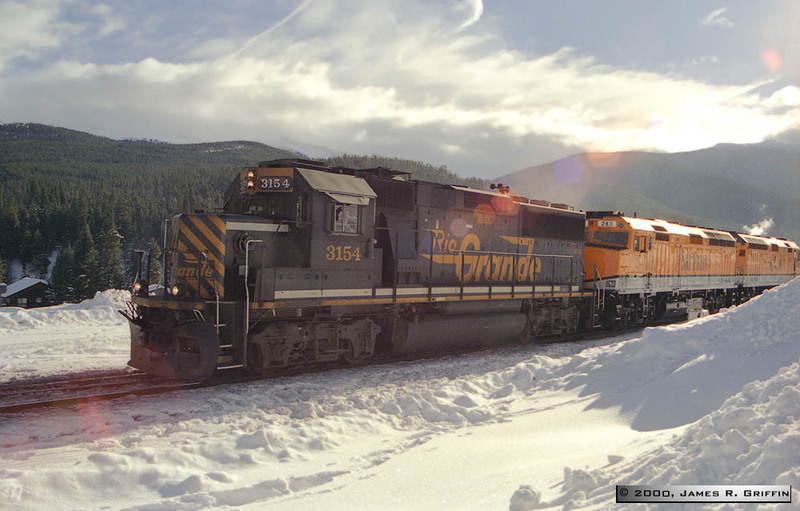 3154 is on the point of the Ski Train on 12/28/2000, seen here after unloading at Winter Park. This was the first season of service for the newly-painted F40PH’s, but No. 242 was having mechanical problems. So, No. 3154 got the call to substitute on the train. 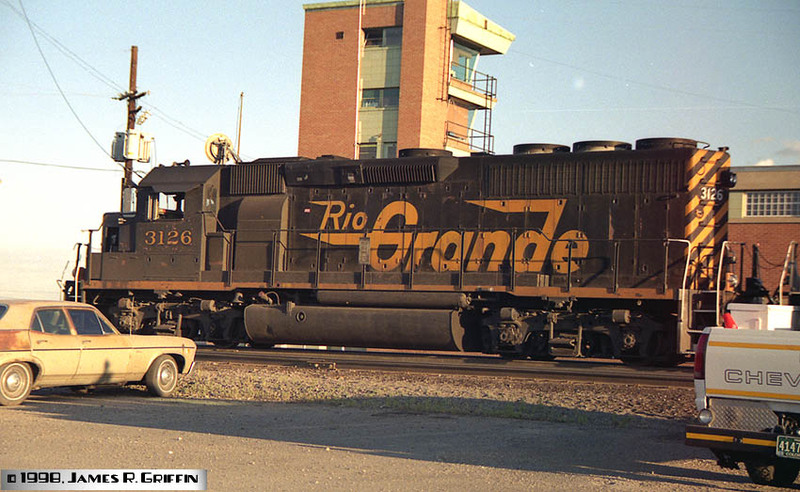 Yes, it was great to look out the window and see a Rio Grande motor on the head end! The 3154 was patched to UP 1900 on 1/25/02. No. 3155 — leading unit of a pair of GP60’s, with the Ski Train at Plainview (1/04/1997). At some point her anticlimber was repainted black, instead of gold like the rest of the fleet. This probably happened after she was in a wreck in Spanish Fork Canyon, UT, in 1992.The 3155 was patched to UP 1901 on 1/25/02. Here it’s seen at Pueblo on 6/30/2006. No. 3156 — the trailing unit of a pair of GP60’s, with the Ski Train at Plainview (1/04/1997). 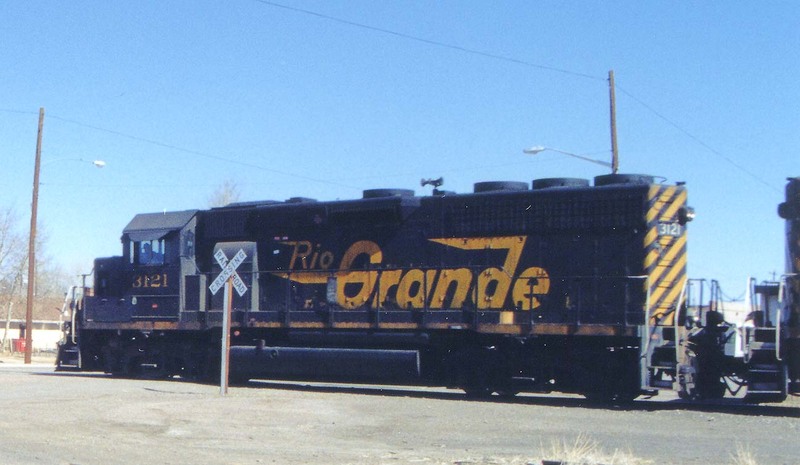 The DRGW GP60s were used commonly on the Ski Train during the 96-97 season, making for an all- Rio Grande passenger train (in the era of UP ownership, more’s the irony).The 3156 was repainted as UP #5702 on 5/11/98, and renumbered 1902 on 1/05/2001. Nos. 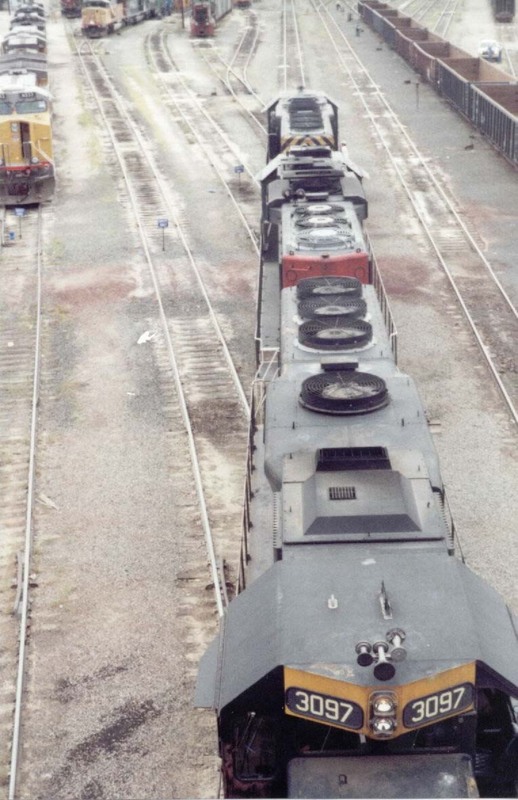 3154 and 3155 — nearly four years later, the two remaining sisters rest between assignments on the ready line at North Yard, Denver(11/24/2000). Beat the Train? Nope.” (AP) Colorado State Trooper Bill Judy investigates the scene of a fatal train-truck crash about 10 miles south of Fountain, Colo., Monday. 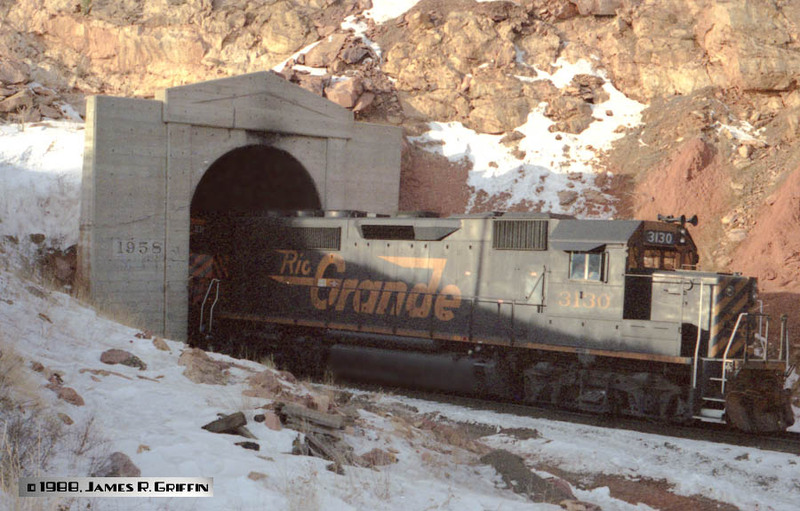 A man from Pueblo, Colo., was killed when his truck collided with the Rio Grande train.” – Article from December 1996, where the MDVPU (Denver-Pueblo) daily freight powered by all three Rio Grande GP60’s was involved in this unfortunate incident. 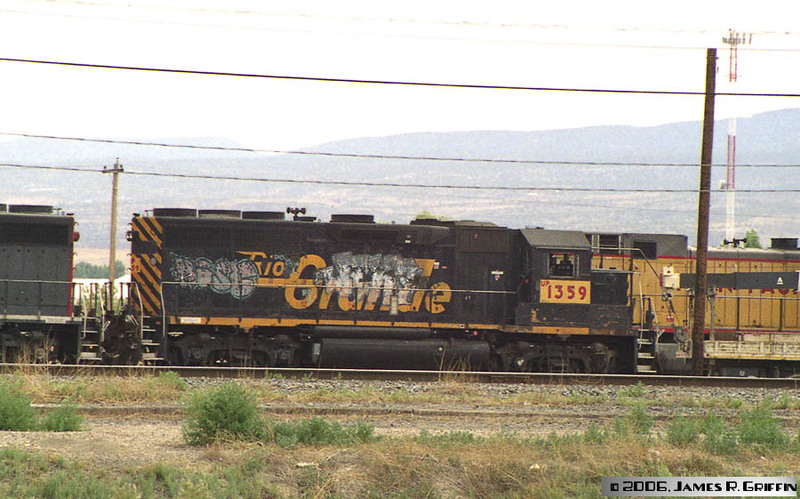 To be clear, I don’t include the Ski Train’s three F40PH locomotives as Rio Grande units. 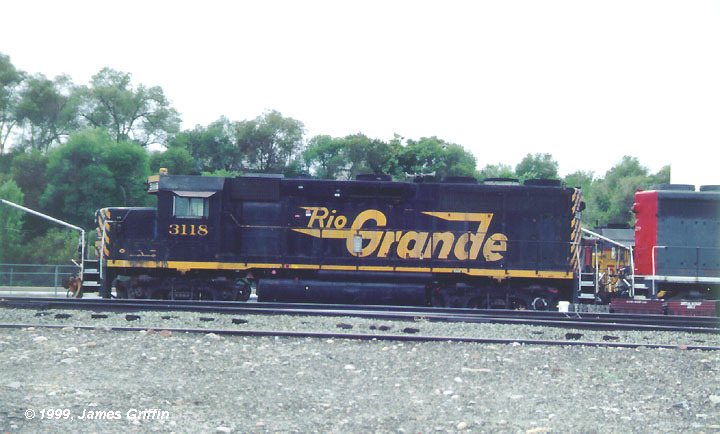 Despite the paint scheme, the historical connection to the D&RGW, and the fact that they actually wore a Rio Grande herald on the flank, they were bought and painted many years after the D&RGW had ceased to be– and were owned by Ansco. That all being said, they were certainly a nice tribute. Kudos to Sean Flannery for advocating for that scheme.